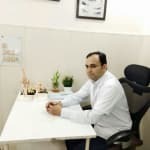 Dr. Pankaj Sharma is a trusted Physiotherapist in Sector-15, Gurgaon. He has been a successful Physiotherapist for the last 11 years. He has completed Bachelor of physiotherapy . You can consult Dr. Pankaj Sharma at Jyoti Hospital & Urology Centre. in Sector-15, Gurgaon. Don’t wait in a queue, book an instant appointment online with Dr. Pankaj Sharma on Lybrate.com. Find numerous Physiotherapists in India from the comfort of your home on Lybrate.com. You will find Physiotherapists with more than 25 years of experience on Lybrate.com. We will help you find the best Physiotherapists online in Gurgaon. View the profile of medical specialists and their reviews from other patients to make an informed decision. I am 49 years old. During sleep suddenly I feel shortage of oxygen and sleep breaks UP feel suffocation. Why it is so? And sometimes I feel shoulder pain either side from last one year. Simultaneously I feel weakness and weakness in eyesight. Why so? A very common complaint, a number of factors can cause wrist pain but arriving at the exact cause can be a tad bit difficult. Depending on the cause, wrist pain can vary in intensity. What causes pain in your wrist? Injury to any part of the wrist can lead to wrist pain and impinge on your ability to use the affected hand and wrist. The causes can be injuries like sudden impacts and repetitive stress; arthritis like osteoarthritis and rheumatoid arthritis; or diseases such as carpal tunnel syndrome that affect this part of the body. 1. Sudden impacts - Falling forward onto your extended hand can give rise to instances of wrist pain. Injury occurring from this sudden impact can cause not only sprains and strains but also fractures. 2. Repetitive stress - An activity that involves the movement of your wrist in repeating motions can cause the joint tissues to be inflamed or give rise to stress fractures, especially if the movement is performed without any break for a long period of time. 3. Rheumatoid arthritis - In this disorder, both the wrists can get affected. In general, the disorder sees your body's immune system attacking tissues of your body. 4. Osteoarthritis - Although the condition is very uncommon in the wrist, it occurs in individuals who have suffered a wrist injury in the past. Osteoarthritis typically happens when the cartilage that acts as the cushion at the end of your bones undergoes deterioration with time. 5. Carpal tunnel syndrome - An increase in pressure on the median nerve (a nerve that affects the sensation or movement of your hand) that passes a passageway called the carpal tunnel can cause you to suffer from wrist pain. In addition to these causes, instances of Kienbock's disease and ganglion cysts can also lead to this problem. How to identify the signs of the problem? The pain can vary depending on the cause. So, wrist pain arising out of osteoarthritis will exhibit a dull pain while that from carpal tunnel syndrome will give a pins and needles sensation. Many times, the location of the pain can help the doctor to determine the cause behind the symptoms you may experience. If you wish to discuss about any specific problem, you can consult a General Physician. My wife got accident and her right leg tendon got cut now she have pain on hell what can be done. I have eye dryness due to heavy usage of system and have back pain so that I can't work for long time. Please Suggest. Hi I am 32 years and weighing 75 kg. I have knee pain problem. I feel lack of lubrication in knees. There is always clicking sound and sometime I can feel friction between bones. Earlier it was in right knee only but now it's started in left also. I tried physiotherapy but of not much use. please help me out as running is my part of my job. I don't want to quit running. Waiting for your answer. Thank you. Core Strengthening Exercise- Straight Leg Raised With Toes Turned Outward, repeat 10 times, twice a day. Hams Stretching- lie straight, take the leg up, pull the feet towards yourself, with a elastic tube or normal belt. repeat 10 times, twice a day. Quadriceps Exercises- Lie straight, make a towel role and put it under the knee, press the knee against the role, hold it for 20 secs. Repeat 20 times twice a day. This will help relieve some pain. Sir, My right bone met with an bike accident and my colorbone got fractured and is treated with the SURGERY OF PLATES AND SCREWS. I am the cricket and volleyball player at university level CAN I RETURN BACK IN TO SPORTS AFTER HEALING. If yes. In how many days I can return back to sports. Yes you can play normally but before that you need proper rest for a month following proper physiotherapy you need at least 8-12 weeks of recovery time before playing. Dear dr. I have a pain in my right joint of shoulder. I guess it is call tendo pain. Is it a cervical spondylitis. Have taken physiotherapy for 10 days. Pain has got reliefed but not fully. At some times it pains. Can you suggest what needs to be done. Hi thanks for your query and welcome to lybrate. I am Dr. Akshay from fortis hospital, new delhi. Shoulder pain could be due to multiple reasons like tendinitis, arthrosis, rotator cuff pathology etc. Cervical spondylitis is an entirely different pathology so the two should not be confused at all. Your pain could be due to some tendinitis in your shoulder. But since physical therapy has helped you, I advise to continue the same and take short course anti-inflammatory medication for 5-7 days. Please let me know if your pain increases, or if it is associated with any other issue? do not hesitate to contact me if you need any further assistance. Day before yesterday I was gone through my tmt test and that was negative. But from yesterday evening I am feeling pain in my left arm and neck. So is this cardiac or what? May be neck stiff is possible so go near a physiotherapist for check up neck stiff ya cs symptoms are match. Pain in joints especially shoulder joints while lifting heavy items. The pain comes not during lifting but after a while. The pain reaches such levels that I can't lift my hands with the help of shoulders and persists for a week or so. Kindly let me know.